View of the ca. 1883 Bathing House. 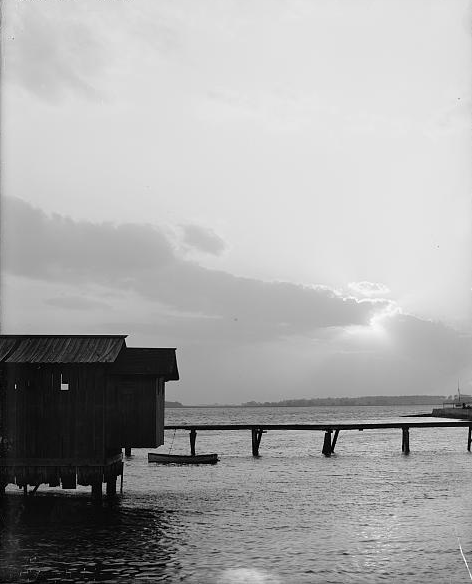 Throughout the nineteenth century, white Charlestonians used saltwater bathing houses for swimming and recreation. Offering separate areas for men and women, these floating structures were set beyond the low-water mark and connected to high ground by a bridge. Bath houses were open to paying patrons from early summer though late autumn, closing intermittently when damaged by storms. Charleston's first recorded bath house was planned in 1813 as "a circular floating bathing house 250' in circumference… with forty capacious private bathing rooms lighted by venetian windows, a large swimming bath in the center." 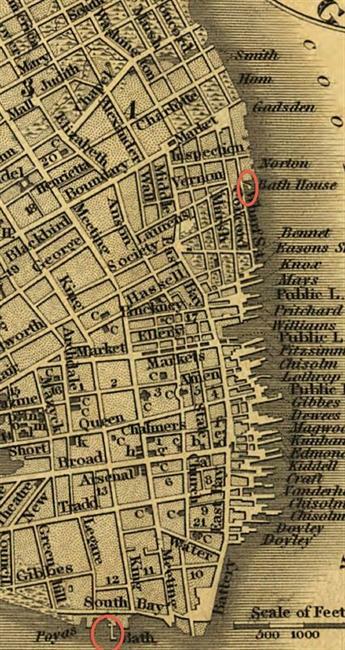 The bath house opened in the spring of 1814, connected by a walkway to East Battery below today's Atlantic Street, and was not the grand structure initially promoted. On July 1, 1815, the City Gazette informed its readers that "repairs to the Salt Water Floating Bath are complete, and the house hauled out to its moorings. It is put afloat, we understand, by means which secure it against the possibility of sinking; and the bathing apartments are so lined as effectually to exclude those marine animals which were so troublesome last year." Although the floating bath attracted patrons, it was not a profitable venture. 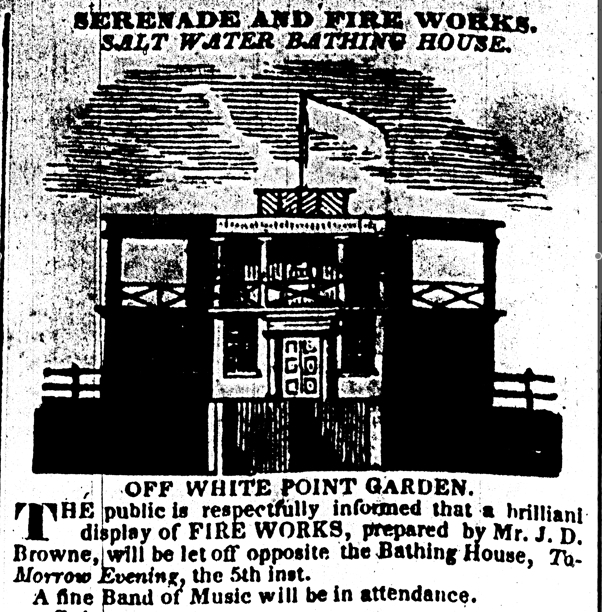 In March, 1820, John M. Frazer advertised for subscriptions in a new enterprise, noting that "many attempts have been made to establish a bathing house, but none of them have succeeded… it seems truly astonishing." 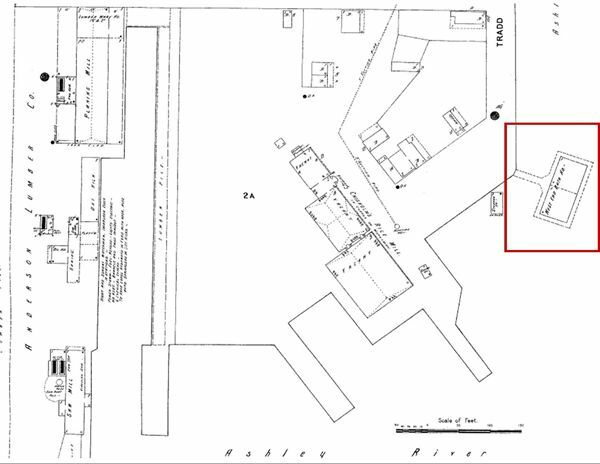 Frazer's bath house was a fixed structure on a palmetto log foundation forty-six feet square, set at the low water mark east of Laurens Street. Like its predecessor, it was enthusiastically received. The City Gazette declared that Frazer's elegant bath house "promises to become a very fashionable, as it already is a very useful resort to the inhabitants of our city. It is supposed by many that an hour or two spent at that place (though they should not partake of the pleasures of the bath) gives equal, if not superior comforts, to a trip to Sullivan's Island. 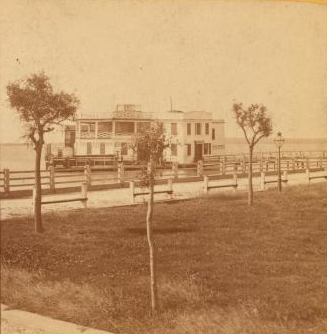 The advantages attending this bathing-house are much greater also than can be derived from visiting the Battery, inasmuch as we are sheltered while there, from the damp dews of night." After sixteen years of operation, Frazer's Bath House was "almost entirely destroyed" by a hurricane in September, 1835, and declared beyond repair. 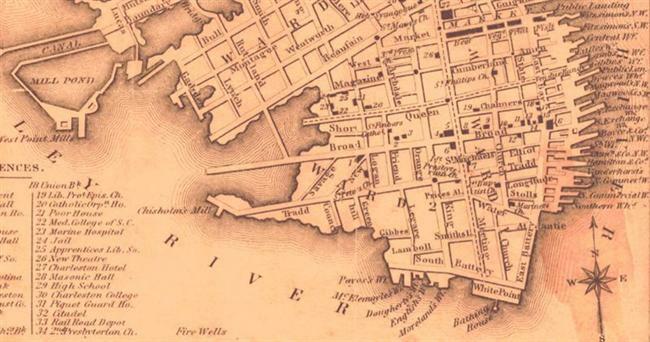 In 1842, Charles P. Frazer signed a ten-year lease for the "Low water lot of land situate on Ashley River… one hundred feet from the White Point Garden, with a six foot wide passageway." The Courier endorsed the enterprise, which "well deserves general encouragement and patronage. The warm season is rapidly approaching and we cannot too earnestly recommend to the community, the great importance of sea bathing as a source of health and recreation... and also the importance of having our youth generally, taught to swim.... We are glad that a large and elegant Bathing House has at length been established in Charleston, where it has been so long and so much wanted." The cyclone of September, 1854, heavily damaged the bath house by wrenching the brig Eureka away from Southern Wharf, pushing it into the bathing house, and sinking it at the far side of the Ashley River. The bathing structure was repaired, and rebuilt again after the Civil War. In 1866, the City of Charleston leased it to Michael McManmon for five years, for one dollar per as "the low water lot on South Bay on which the Salt Water Bathing House stands, which was formerly leased to Charles P. Fraser, afterward to James English." McManmon promised to keep the structure in repair, permit no alcohol on the premises, and open it free of charge to the children of the orphanage on one day every two weeks. McManmon's bathing house was a casualty of the September 28, 1874, hurricane; the proprietor and his family barely escaped with their lives. At the height of that daytime storm, hundreds of spectators lined the Battery while "Mrs. McManmon and her two little children stood at the open window with arms outstretched." Several boats tried, and failed, to reach the bath house before a young serviceman named Harry Hansen fastened a line to his waist and battled his way to the rocking structure. The eye of the storm occurred just after he safely returned with McManmon's daughter, and two small boats retrieved the rest of the family. The next day, nothing remained of the bathing house except "a rickety crumbling ruin and the stumps of the posts upon which it was built…. The loss to Mr. McManmon is particularly severe, as he had just spent a large sum of money in putting repairs upon it. It is not likely soon to be rebuilt; so that landmark of Charleston may be considered as gone." 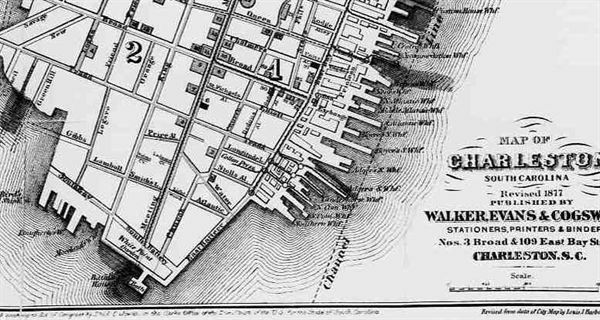 It does seem to have been replaced, however: a map of Charleston published locally in 1877 shows a bath house off White Point Garden. 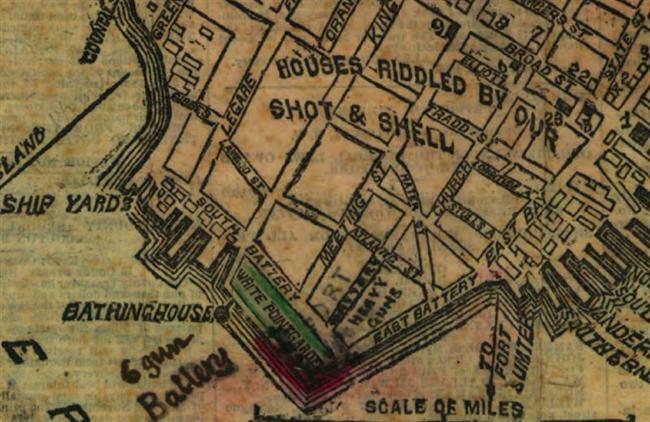 The site of the bathing house was close to the city's main tidal drain at the foot of Meeting Street, where sewage waste flowed into the harbor. Sometime after 1882, a new "salt-water Bathing Pavilion" was established at the foot of King Street. 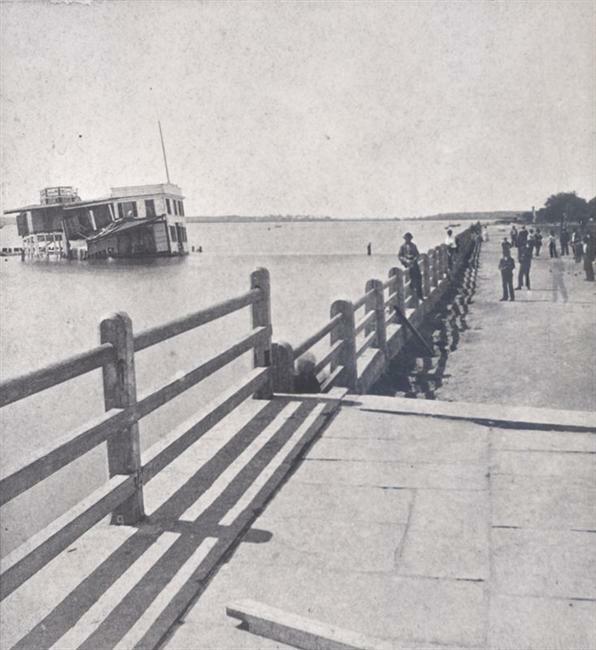 Torn adrift and wrecked in the cyclone of August, 1885, it was rebuilt as a much smaller structure which was in turn destroyed by the storm of August 27, 1893. Charleston's last saltwater bath house was the West End Bath House, built in the 1890s at the end of Tradd Street near the wharf of Chisolm's Rice and Saw Mill. Into the twentieth century, a few Charlestonians held to the custom of spending a few hours on a floating pavilion, swimming or relaxing in the fresh sea breeze. Charleston City Gazette, Courier, and Mercury. "Mayor Courtenay's Annual Review." Year Book, City of Charleston, South Carolina, 1882. Year Book, City of Charleston, South Carolina, 1885. Purcell, Joseph. "Bathing House." City Plat Book, p. 49, plat 5, 1842. Thomas, W. H. J. "Swimming in Local Rivers Once an Enjoyable Sport." News and Courier/Evening Post Tricentennial Edition, March 31, 1970. Bathing House after the Hurricane of 1885. Shown in 1872, the Bath House was destroyed by storm in 1874. Walker, Evans & Cogswell. Map of Charleston, South Carolina. Revised 1877. 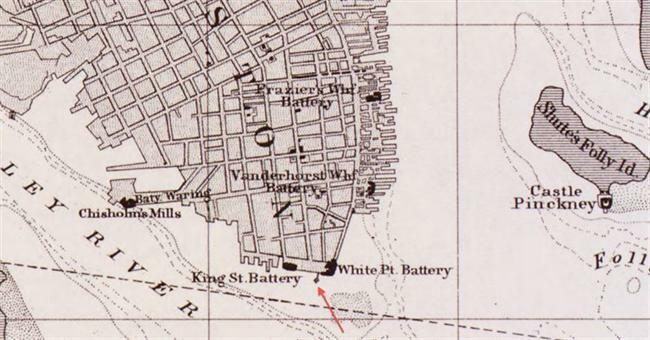 In 1877, the bath house floating off White Point Garden was only a few blocks from the busy wharves along the Ashley and Cooper rivers. West End Bath House, 1902.